The front of a Werner Pfleiderer & Perkins “drawplate” oven, until recently preserved in the Great Northern Hotel, Peterborough. It was originally installed in about 1892 with further improvements being carried out in May 1904. This oven would have supplied bread and other products to the railway refreshment cars and stations over a large area, including Lincoln, Doncaster, Leicester and Luton. The floor rails and wheels that allowed the sole-plate to be withdrawn from the oven for loading and unloading can be seen clearly. 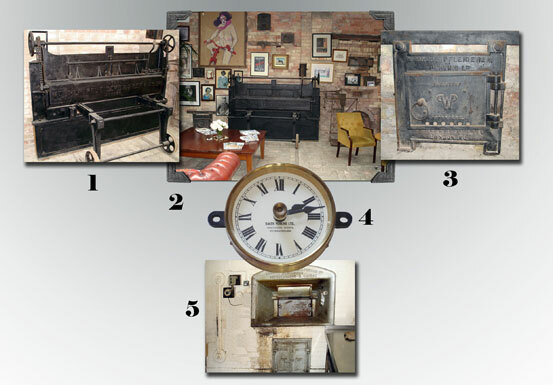 The above oven as installed in the Old Bakehouse art gallery of the Great Northern Hotel, surrounded by other memorabilia. All of this equipment was removed in 2010. One of the above oven’s access doors (the stokehole?). Similar ovens were manufactured by Joseph Baker & Sons and some of both companies’ ovens enjoyed a remarkably long working life. This “clock” contains no mechanism. It was attached to the front of a “peel” or a “drawplate” oven and the hands positioned to remind the baker when his batch of loaves should be ready to be removed from the oven. This example of a peel oven is in the Windmill Bakery in Ramsey, near Peterborough. Converted to run on oil, it is not currently in use but is capable of being fired up should the price of oil justify it.